An announcement for Walt Whitman’s “Manly Health and Training,” published in The New York Atlas on September 12, 1858. 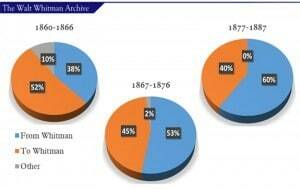 Image Courtesy of The American Antiquarian Society. In the third open-access issue of the Walt Whitman Quarterly Review (WWQR) Editor Ed Folsom and Managing Editor Stefan Schöberlein publish in full a newly discovered book-length work by the poet Walt Whitman entitled “Manly Health and Training.” Zachary Turpin, a PhD candidate in English at the University of Houston, recently discovered “Manly Health and Training,” a previously unknown thirteen-part journalistic series of 47,000 words that originally appeared in the New York Atlas in 1858. Turpin’s important find means that “Manly Health and Training” can now be republished and confidently attributed to Whitman for the first time since 1858. As Turpin points out in the detailed introduction that accompanies “Manly Health and Training” in WWQR, surviving issues of the Atlas are rare today, even on microfilm, and he used one of the few remaining reels containing the newspaper, currently held by the American Antiquarian Society, to find “Manly Health and Training.” The byline for each of the installments lists the author as “Mose Velsor of Brooklyn,” a pen name that Whitman was known to have used occasionally for newspaper articles, and some of the articles from the “Manly Health” series also correspond in subject matter and/or wording with selections from Whitman’s notes on health and the body. 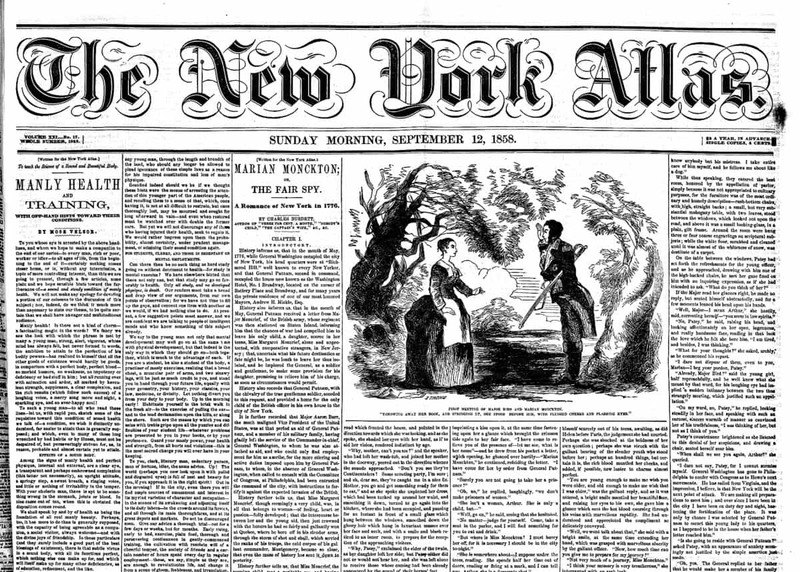 The first installment of Walt Whitman’s “Manly Health and Training” on the front page of The New York Atlas on September 12, 1858. Image Courtesy of the American Antiquarian Society. Turpin’s discovery of Whitman’s “Manly Health and Training” will certainly shed new light on the poet’s activities in the years following the publication of the articles and leading up to and continuing through the Civil War. 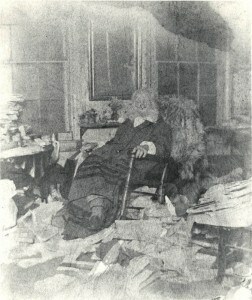 If, for example, Whitman advocated a training program that involved exercise and a healthy diet, then why did he choose to spend so much of his time in 1859 and the early 1860s at Pfaff’s, a New York beer cellar and popular American Bohemian hangout, known for its coffee, lager beer, and wine selection, as well as its substantial food offerings? How does Whitman’s interest in leading American men toward sound, muscular, and virile bodies change the way we view Whitman’s seeming need to volunteer in the hospitals of the Civil War, where he would have seen first-hand the devastating injuries—the gaping wounds—in those very bodies he was seeking to guide toward a state of “perfect health”? And what does Whitman’s insistence that the very act of reading is not a “half-sleep” but rather a “gymnast’s struggle” mean for us, as readers of his works, in light of “Manly Health and Training,” with its assessment of prize-fighting and advocacy of exercise? With the publication of “Manly Health and Training” in WWQR, we can begin to answer these questions and, no doubt, to formulate many others. But Turpin’s find, 158 years after the original publication of Whitman’s articles, should also draw our attention to the fact that even when it comes to well-known authors like Whitman, much remains to be discovered. This is likely true, not just of Whitman, but of many other nineteenth-century writers when our research includes newspapers and magazines. Examining periodicals in print and digital forms, as well as archival research in general, has yielded significant finds in the field of Whitman Studies over the past several years. A new Whitman poem, as well as numerous reprints of his short fiction and reprints of his poetry in periodicals have come to light, and, recently, a letter Whitman wrote for a Civil War Soldier was discovered in the National Archives. Turpin’s find also serves to remind researchers that not all newspapers and magazines from the past are digitized, available, and easily searchable online. In fact, many periodicals are still available only on microfilm and/or in print form. The discoveries we make in the future, then, will depend a great deal on where we look and how we preserve and use archival material in all formats. Finally, the publication of “Manly Health and Training” in its entirety in the current WWQR is a noteworthy feat in itself. In October 2015, during open-access week, WWQR, a University of Iowa journal and the international journal of record in Whitman Studies, made the transition from a print journal to an online only, open-access publication with the help and support of the Digital Scholarship and Publishing Studio at the University of Iowa Libraries. This online format, as the editors of the journal make clear in their foreword to the issue, has made possible the publication in full of Whitman’s “Manly Health and Training.” In the journal’s previous print version, printing costs and page limits would have necessitated the careful selection of only a few excerpts from this previously unknown text. One of the many benefits of offering a scholarly journal as an online and open-access resource is that this digital format opens up a range of publishing options and formats not possible in print alone. 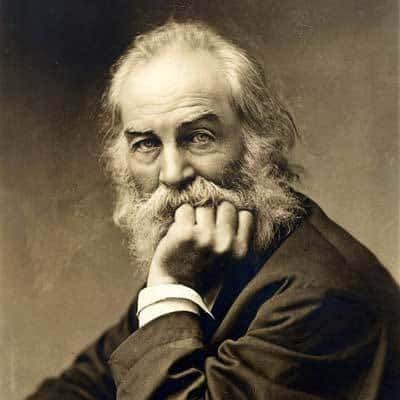 As a result, the editors can share this newly discovered piece of the poet’s writing with an ever-growing international body of Whitman readers who access his writings via an internet connection. In the future, “Manly Health and Training” will also be available on the Walt Whitman Archive. If, as Whitman wrote in his advertisement for “Manly Health and Training,” he intended this text “for the People,” he almost certainly would have approved. 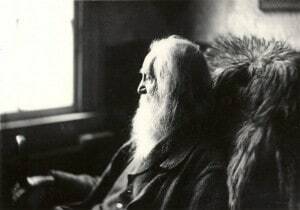 It is my hope that all readers of “Manly Health and Training” will actively engage and even struggle with this piece as Whitman recommended, since it remains for us–the readers–to investigate how Whitman came to write this piece, to trace the origins of these ideas, and to determine how we, in coming to this text some 158 years after its first publication, might make use of it in our own time and in our own ways. 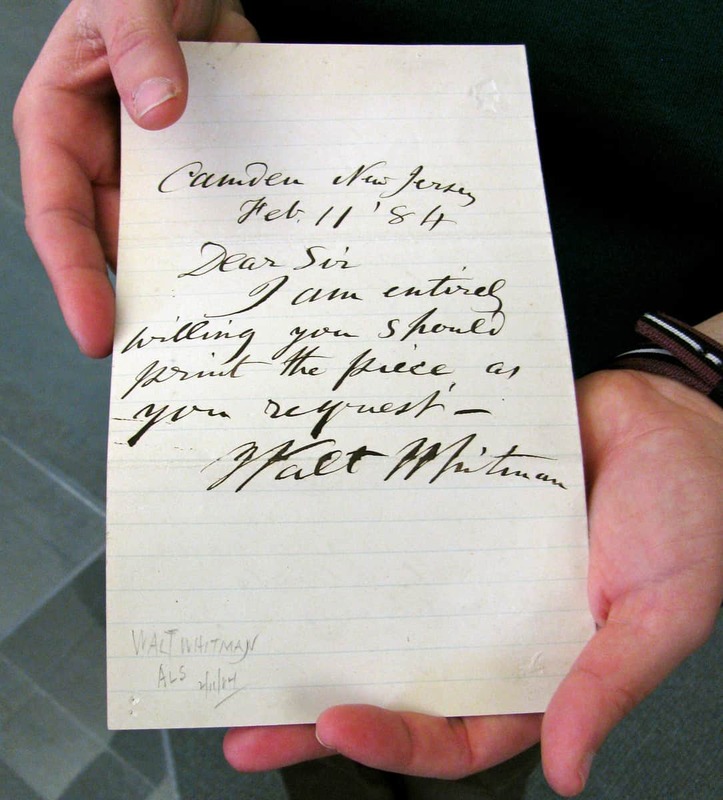 On February 12, 2016, the Digital Scholarship and Publishing Studio hosted the second DH Salon event of the semester—a collaborative presentation highlighting the Walt Whitman Archive’s Correspondence project. Presenters included Ed Folsom (Roy J. Carver Professor of English and Co-Director, Walt Whitman Archive), Stephanie Blalock (Digital Humanities Librarian & Associate Editor, Walt Whitman Archive), Stefan Schoeberlein (Managing Editor, Walt Whitman Quarterly Review & Graduate Research Assistant, Walt Whitman Archive), Alex Ashland (Graduate Research Assistant, Walt Whitman Archive), and Ryan Furlong (Graduate Research Assistant, Walt Whitman Archive). 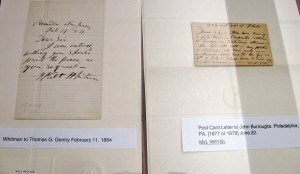 The presentation was accompanied by an exhibit featuring three letters written by Walt Whitman in the 1870s and 1880s. These letters are among the many books and Whitman-related items that are held by Special Collections at the University of Iowa Libraries. During their presentation, the Whitman Archive Correspondence team shared the digital edition of Whitman’s incoming and outgoing correspondence that they are currently building and gave the audience a behind-the-scenes look at the faculty, staff and student collaborations that make this digital project possible. All of the Correspondence team members at Iowa had the opportunity to share their work and research with the audience. 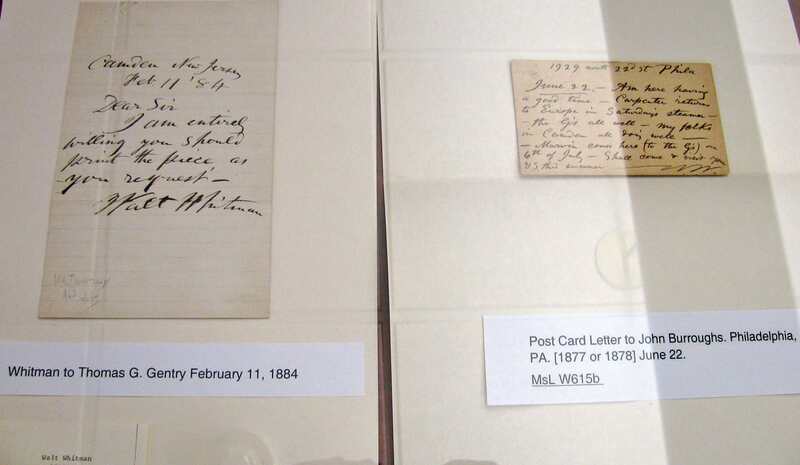 In keeping with the collaborative spirit of the DH Salon, this post, like the presentation itself, reveals the roles of each member of the Whitman Archive Correspondence project team and explains how we make Whitman’s letters available to Archive users. During our talk, I discussed my role as the current project manager for the Correspondence project and my efforts to write our grant proposals, design our workflows, and train our staff, including three graduate assistants here at the University of Iowa and an additional graduate research assistant at the University of Nebraska-Lincoln. I outlined the need for a digital edition of Whitman’s correspondence and the advantages our editions offers over earlier printed collections. I pointed out that our digital edition not only includes the outgoing and the incoming correspondence, but it is also integrated into the overall search functionality of the Whitman Archive. I also emphasized that our digital edition can easily accommodate newly discovered letters and that it is correctable; as a result, our users often become our collaborators by helping us to catch stray errors in transcription or by providing additional information on Whitman’s correspondents. 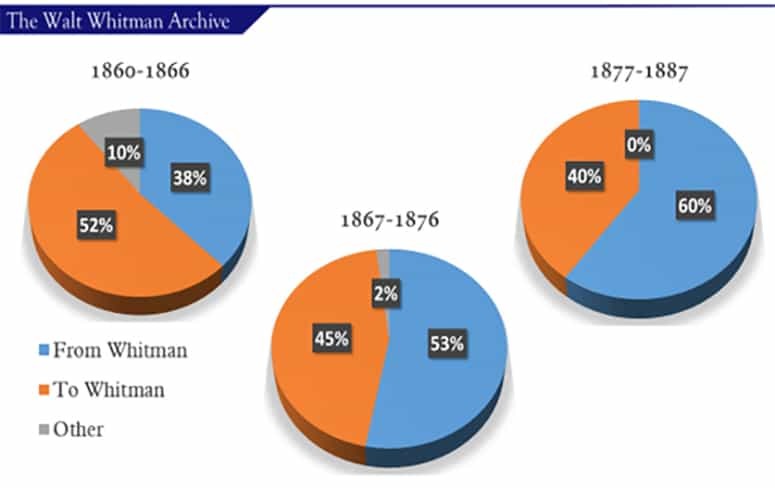 For my part of the presentation, I gave a numerical overview of Whitman’s two-way correspondence and gave some examples of how the Correspondence team is beginning to explore the letters through data visualization and topic modeling. With over 3,775 letters encoded (and most of them already published on our website), we can see some interesting trends emerge from this body of text(s) when we analyze them. Besides noting an increase of extant Whitman-letters from the 1860s to the 1880s, we also find the ratio of surviving letters to and from Whitman shift (from the former to the latter), allowing us to trace the poet’s rise to celebrity and, hence, the collectability of his letters. I also presented some numerical visualizations of the correspondence and showed that Whitman’s letters address topics ranging from the publication of his various editions of Leaves of Grass to his declining health in his final years. I emphasized that the vast amount of information now available to us and our users makes it clear to us that we–the Walt Whitman Archive and the Walt Whitman Quarterly Review–want to engage (and encourage others to engage) with the two-way correspondence not just as individual texts and exchanges but as data. I outlined some of the major challenges of the Correspondence project that I have encountered during the two years I have spent working with the letters. One of the most challenging aspects of creating a digital edition of the two-way correspondence is that the Archive staff must edit letters by a variety of authors writing from a variety of backgrounds, all with differing degrees of competency and literacy. 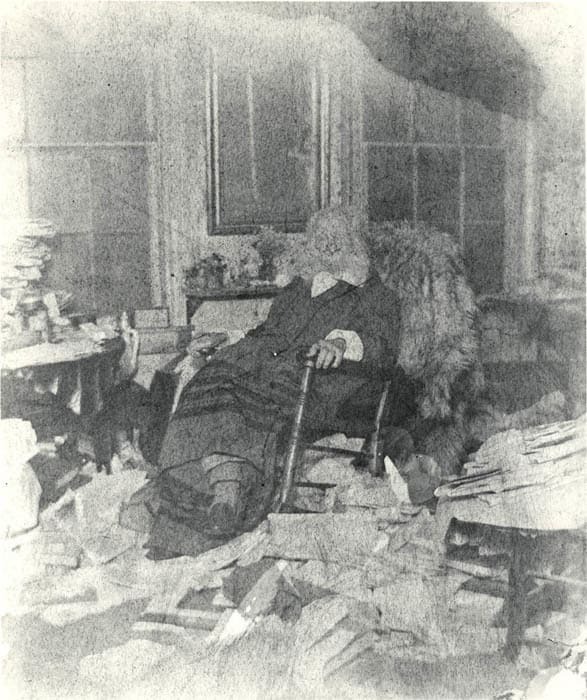 Whitman received letters from doctors, university professors, book editors and publishers, but also from insane asylum patients, wounded soldiers, and the occasional obsessed fans. As a result, things like author style, syntax, and overall legibility vary drastically from one writer to the next, and the team has to work together to ensure that in the process of editing, things like words, punctuation, and paragraph divisions, remain consistent with the written letter. I also pointed out that despite these challenges the Whitman Archive thrives precisely because of the unique opportunities it affords archivists and users alike. Because the digital platform and the infrastructure around which it is built is so adaptive and open to immediate revisions, users are always encouraged to contact and interact with members of the Correspondence Project team. And while the various personnel at Iowa have developed a rigorous process of transcribing, encoding, and checking letters, the archive allows for a level of user interactivity that is rarely seen in other digital archives. For my part of the presentation, I discussed the work I have done as a first-year graduate research assistant for the Walt Whitman Archive. My primary responsibilities have included transcribing, encoding, and verifying Walt Whitman’s incoming and outgoing correspondences for 1887 and 1888. I demonstrated how this three-step process ensures precise and legible transcriptions of manuscript images are displayed for Whitman Archive readers in a user-friendly format and how I work to include pertinent biographical information, annotations, references to other correspondences, as well as the actual content of the letter itself. Ultimately, I showed how my position as a transcriber and encoder serves as a critical first step in accurately recording the contents of Whitman’s (and others’) correspondences before other members of the Archive team process and review them for publication. I reviewed the overall workflow for letters, starting with transcriptions and encoding and extending through first and second checks before coming to me for a final “blessing,” which often involves adding further annotations, clarifying information about correspondents, and correcting transcription errors and typos that have made it through the first checks. I emphasized how the “blessing” by one of the directors serves as the final confirmation of scholarly and editorial accuracy that we can stand behind and stake our reputations as Whitman scholars on. I commented on how there’s a long “workflow” that occurs before we begin the first transcribing work, and that’s the brainstorming at our annual Whitman Archive full staff meeting in Lincoln each summer, where we decide on which projects we want to focus on, strategize about grant applications, decide whether Iowa or UNL (or somewhere else) will take the lead, then work on a grant proposal, the preparation for which often involves the first real steps in the project (generating a list of letters, deciding how many we can promise to the granting agency, and so on). What our presentation revealed, and what I would like to emphasize here is that the Whitman Archive correspondence project is growing in exciting new ways. We are expanding our research to include topic modeling and data visualization, and an undergraduate intern has recently joined our team. The Correspondence team would also like to become a site where graduate students enrolled in the Public Digital Humanities certificate can complete their Capstone experiences. Finally, the Walt Whitman Archive, which turns twenty-one this year, is one of the oldest and most comprehensive digital projects in existence, and collaboration between faculty, staff, and students has been one of the keys to its success. As digital humanists often claim, the digital humanities is collaborative in theory and in practice. The Whitman Archive Correspondence project team is one of many living embodiments of that statement on our campus, as the creation of a digital edition of Whitman’s letters depends on the combined efforts of the faculty, staff, and students that were a part of the DH Salon presentation. The Correspondence team believes that when we do not collaborate and communicate with each other, the library, our institutional partners, and even our users, then the people that suffer most as a result of those actions are those who depend on our site for their research, teaching, and pleasure reading, as well as the graduate and undergraduate students we are supposed to be mentoring toward various career options. For us, these are the people that least deserve to bear those consequences. At the end of the day, the Correspondence team firmly believes that one of our greatest strengths is that we are a faculty, staff, and student collaboration. On Friday, Oct. 23rd, the Digital Scholarship and Publishing Studio hosted the fourth DH Salon of the semester. I was very glad to welcome an enthusiastic group of faculty, staff, and graduate students to the Studio for my presentation, “From Periodical Page to Digital Edition: The Walt Whitman Archive’s pre-Leaves of Grass Fiction Project.” The goal of this project, which is funded by the National Endowment for the Humanities, is to make Walt Whitman’s early fiction easily and freely accessible on The Walt Whitman Archive. For this project, my co-editor Nicole Gray (University of Nebraska-Lincoln) and I have been working to create a digital edition of Whitman’s fiction. Most people know Walt Whitman as America’s poet and the author of Leaves of Grass, a volume of poetry first published in 1855. But when the poet was in his 20s, he wrote a temperance novel Franklin Evans; or, the Inebriate. A Tale of the Times and about 25 pieces of short fiction, all of which were first published in nineteenth-century newspapers and magazines. The holdings of the University of Iowa Special Collections include several periodicals that published Whitman’s fiction. I collaborated with Special Collections Librarians to create an exhibit of these items to accompany my talk. 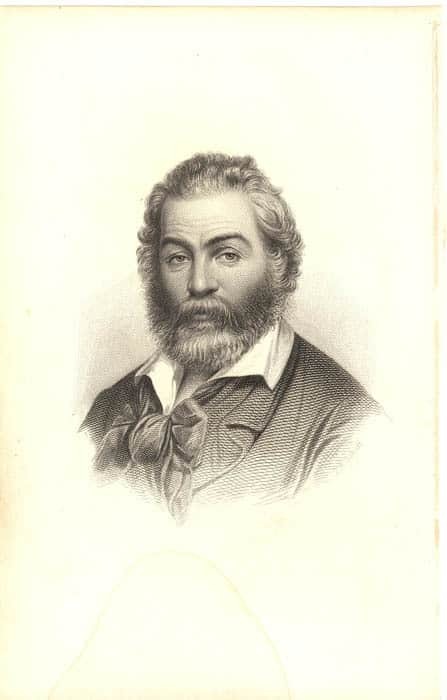 Audience members were able to see Whitman’s temperance novel and his first short story in the periodicals. I discussed some of the major editorial decisions, as well as the process of text encoding that lead to the production and publication of the digital edition. Audience members explored the digital edition of Whitman’s novel and got a preview of the short fiction that is still being edited for publication on the Archive in the summer of 2016. They were also able to interact with two of the Archive’s newest features, a bibliography of the printings and reprints of Whitman’s fiction and a map charting the circulation of the stories across the United States and around the world. These elements of the digital edition are based, in part, on five years of my research, which has revealed several new discoveries, including approximately 350 previously unknown reprints of Whitman’s short fiction in newspapers and magazines and the earliest known printing of at least one of Whitman’s stories. The question and answer session following my talk was an incredibly valuable experience. My colleagues asked thoughtful questions and generously offered suggestions for future work on the project such as adding a time slider to the Whitman Archive’s current map of the printings and reprints of the fiction and using network analysis and data visualization to further examine the circulation of Whitman’s fiction and its relationship to his early journalism. I am grateful for this feedback on our digital edition, and I am excited to continue exploring the publication history and circulation of Whitman’s fiction.